Dryline chase in central TX. 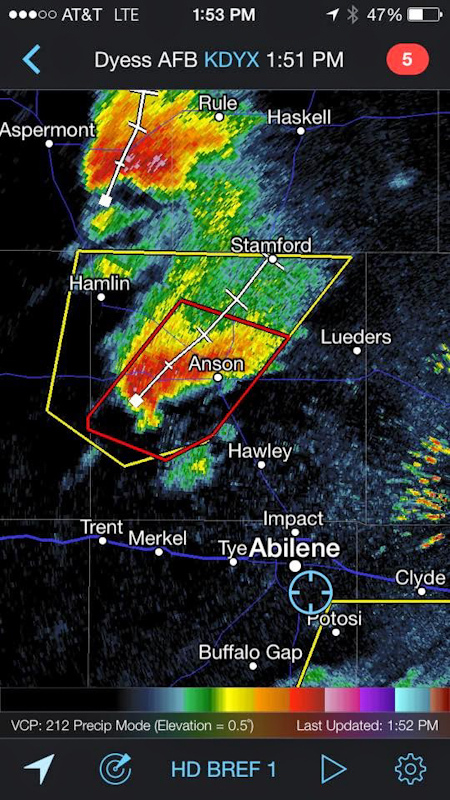 Targeted Abilene for afternoon tornadic supercells. 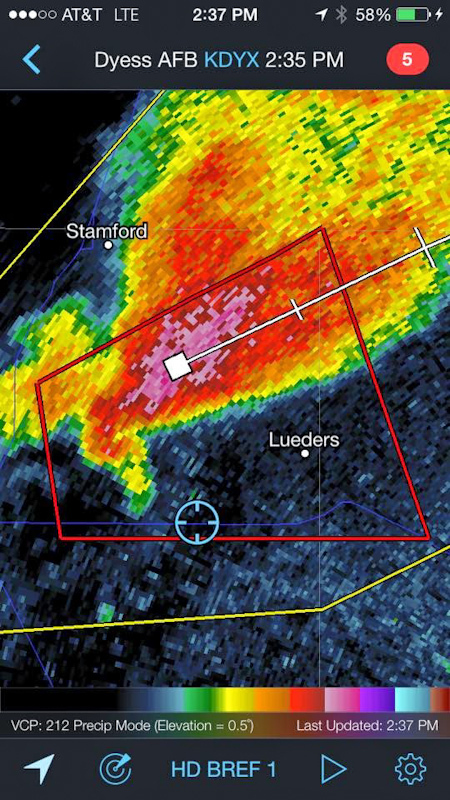 Intercepted tornado warned storm near Lueders noting tight low level circulation overhead before storm fell apart. Retargeted for HP Tail End Charlie near Bluff Dale noting dramatic structure and RFD core. 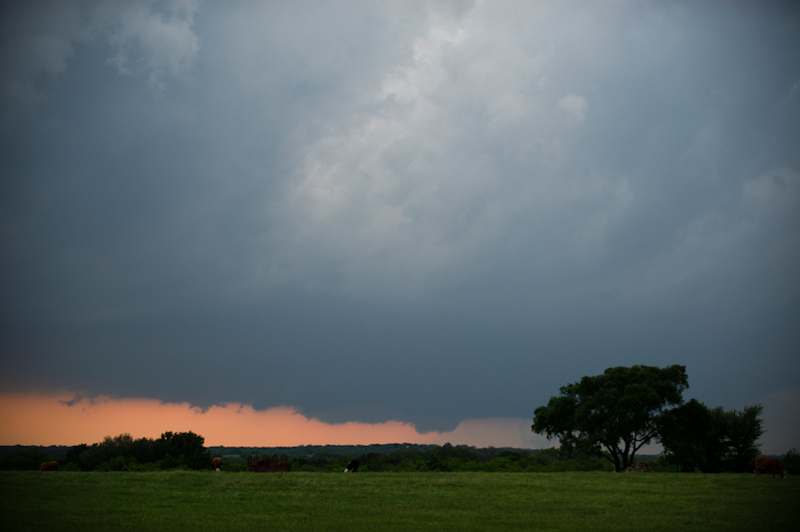 Trailing cell exhibited LP to Classic structure and brief funnel at twilight. 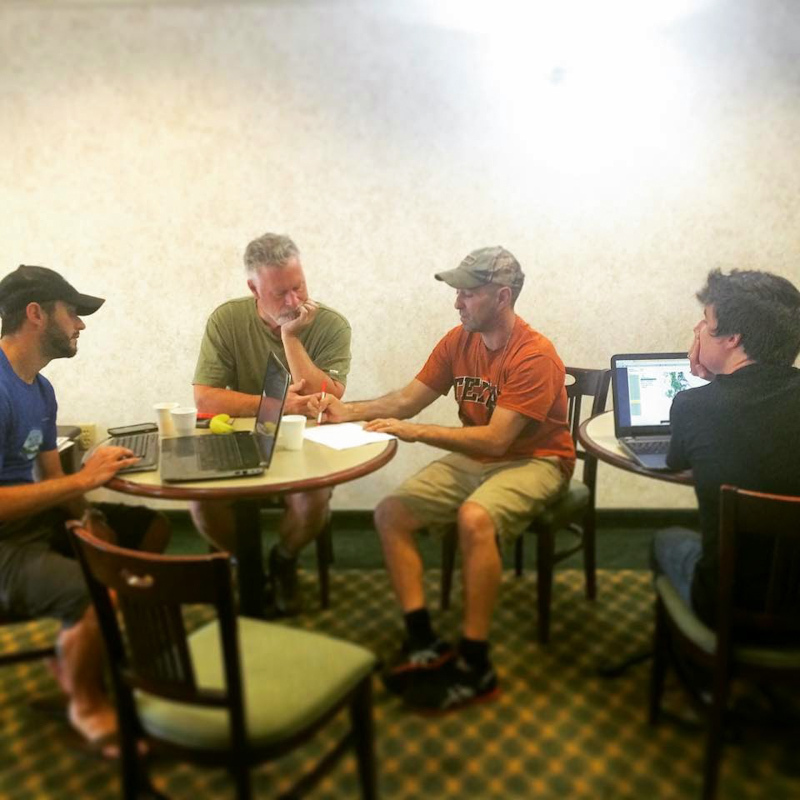 Impacted by training supercells at hotel after dark. 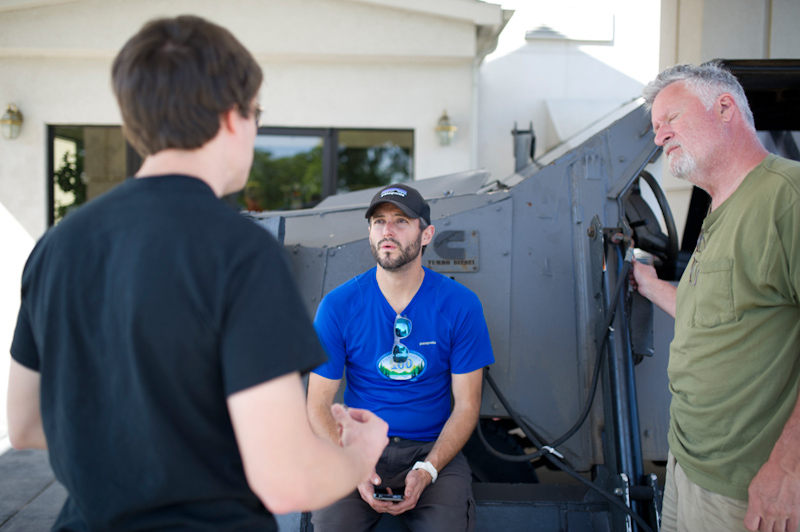 Chase partners: Jennifer Brindley Ubl, Payton Ware, and caravanning with TIV crew: Sean Casey, Justin Walker, and Herb Stein. 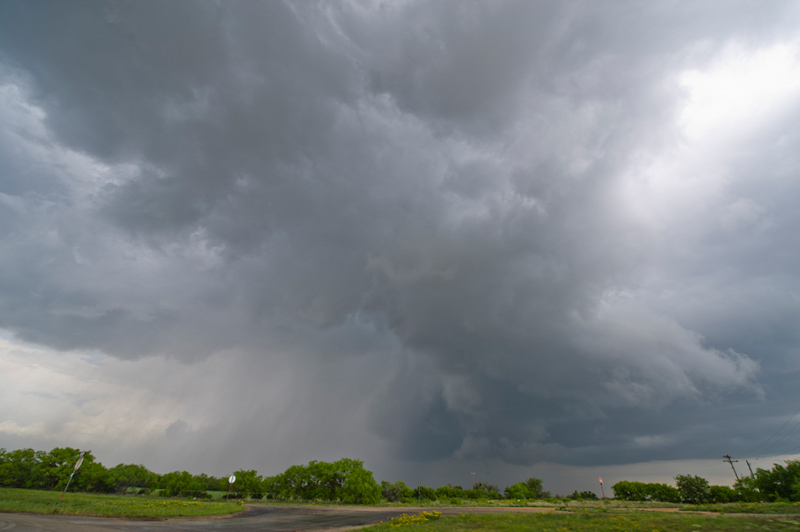 Equipment: Canon 60D, Canon t2i, Canon EFS 10-22, Canon EF 50mm, Sony HDR-xr500v..
April 26 featured a well defined dryline draped across central Texas with strong southwest flow aloft and great veering wind profiles. 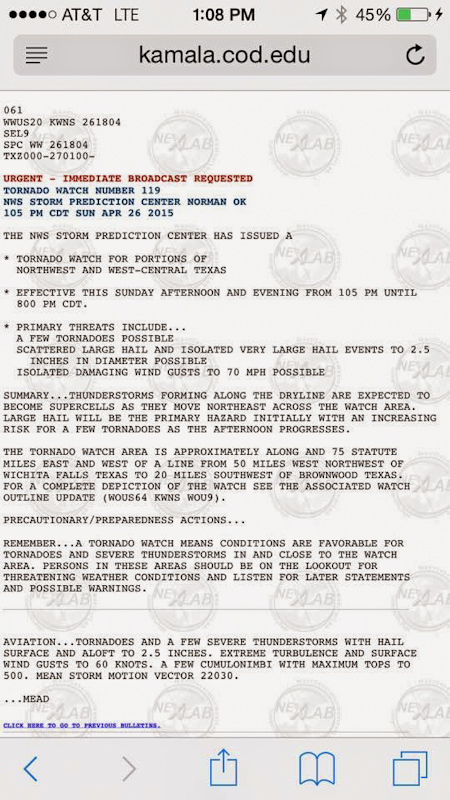 It was a classic setup for bagging ome Texas tubes, and SPC upgraded their tornado outlook as the day progressed to reflect the possibility of significant (EF2 or greater) tornadoes. Jennifer Brindley Ubl and I awoke in Weatherford, TX where we had spent the night after hanging out with Sean Casey and the TIV crew after a down day. Laptops out with continental breakfast coffee, it was time to pick a target for today: Abilene, right off the top of a dryline bulge. Sean sporting his Texas shirt for good luck on our chase. 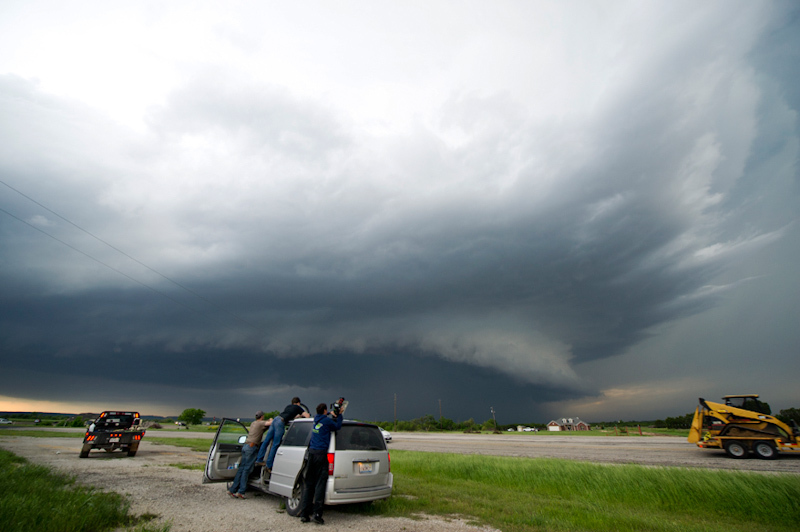 This was our first official chase with the TIV crew this season. 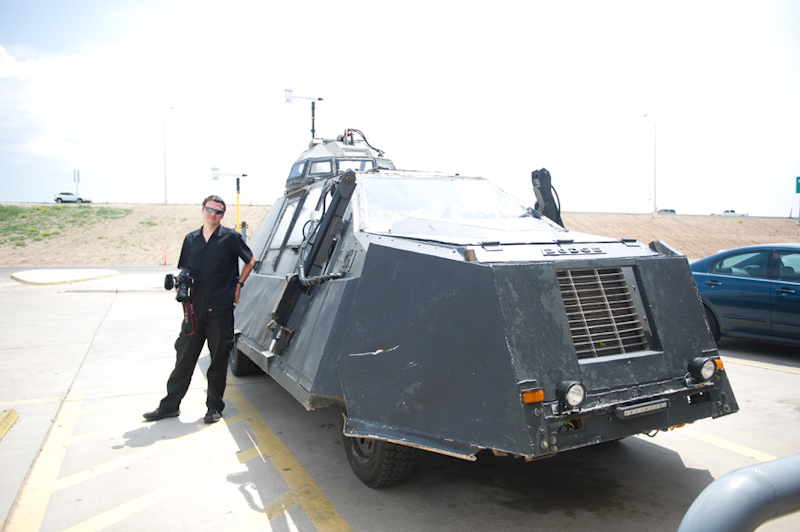 I had been brought on as a forecaster and navigator for the season and assigned to the TIV's follow/support vehicle. 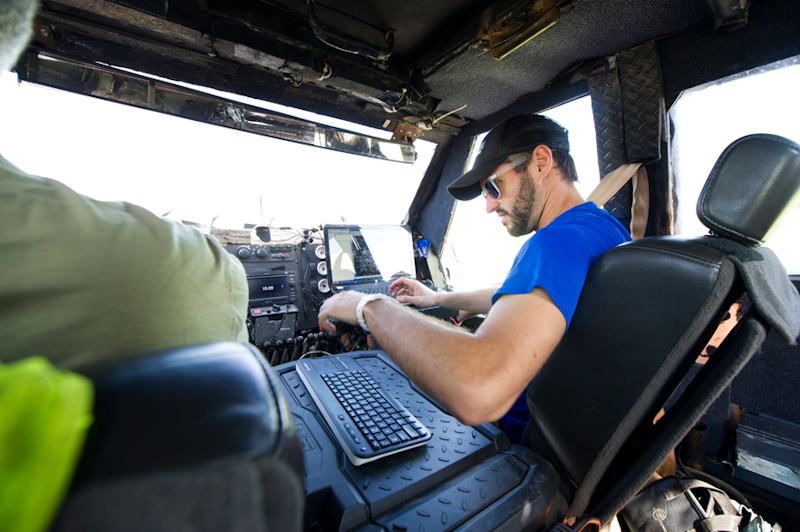 Our goal was to find tornadoes and deploy probes in their paths, filming our encounters for a new Sean Casey IMAX movie. 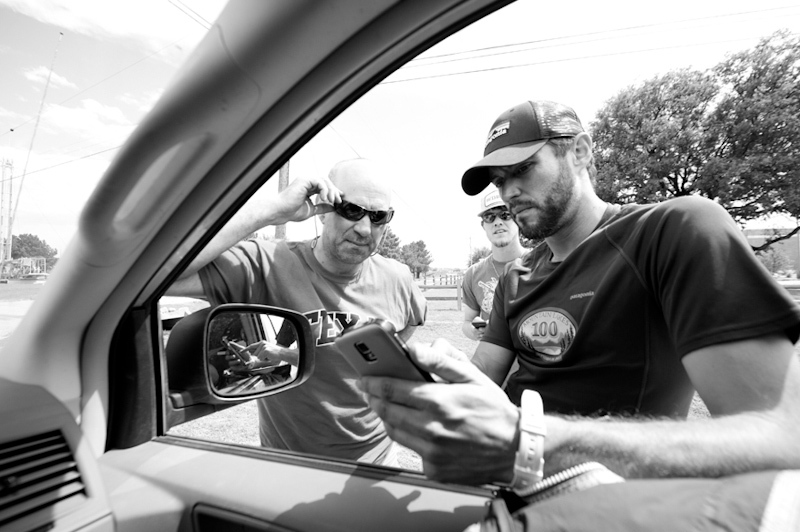 The string of days surrounding this chase warranted bringing the whole team out for the first time. 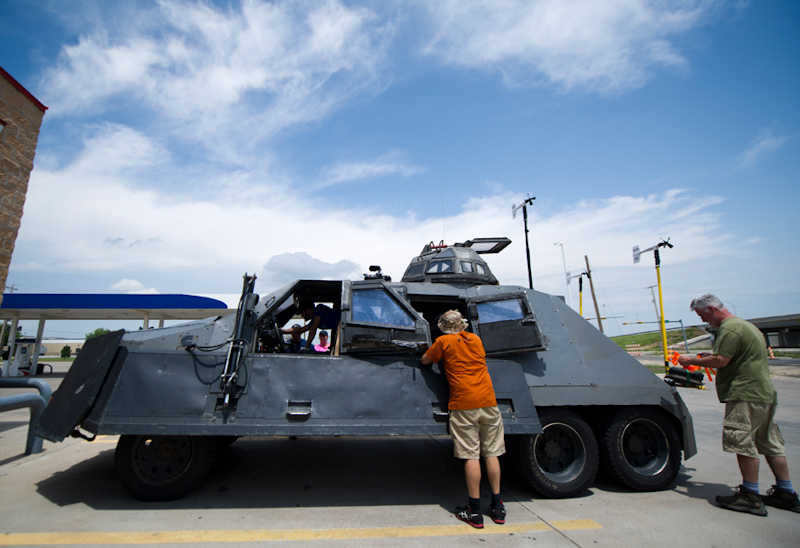 Missing though was Doghouse, the usual support vehicle for the TIV, which was still sitting in Tulsa. Brindley and I would be chasing in the van, which Sean had dubbed "Bubbles". 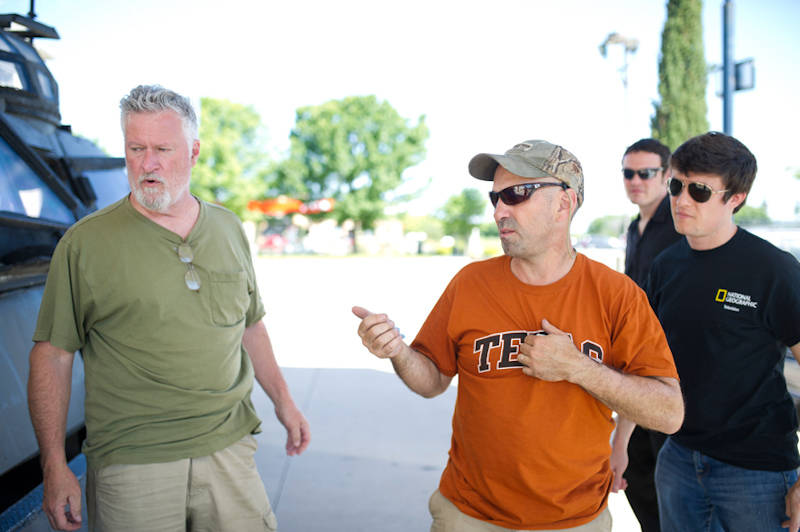 Justin Walker, the TIV's forecaster/navigator and Herb Stein, TIV's driver, and I discuss the day's plan. 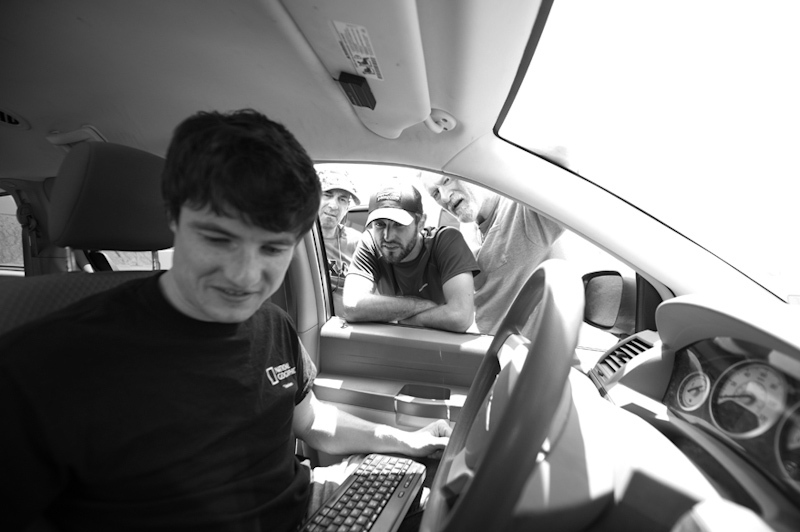 Payton, the support vehicle cameraman, would be riding with us in the van and shooting on a 5k Red Epic camera. A local fan stops by to give Sean a shirt and tell the story behind it. 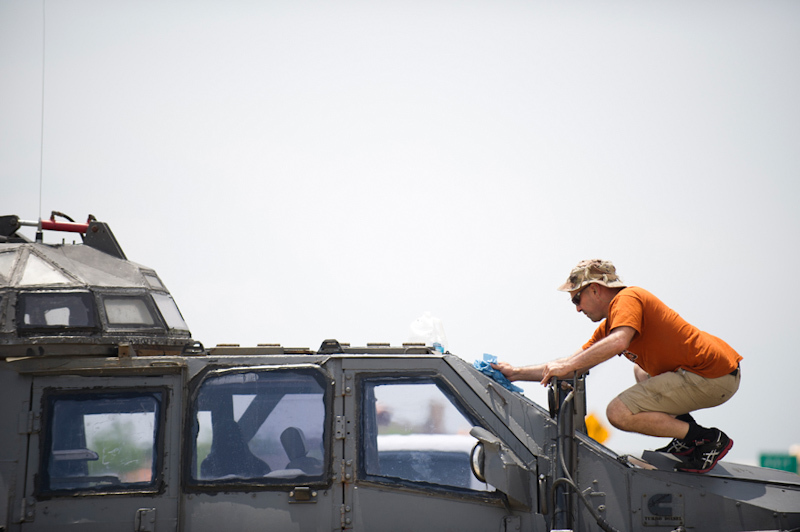 Justin Walker gets set up in the TIV. 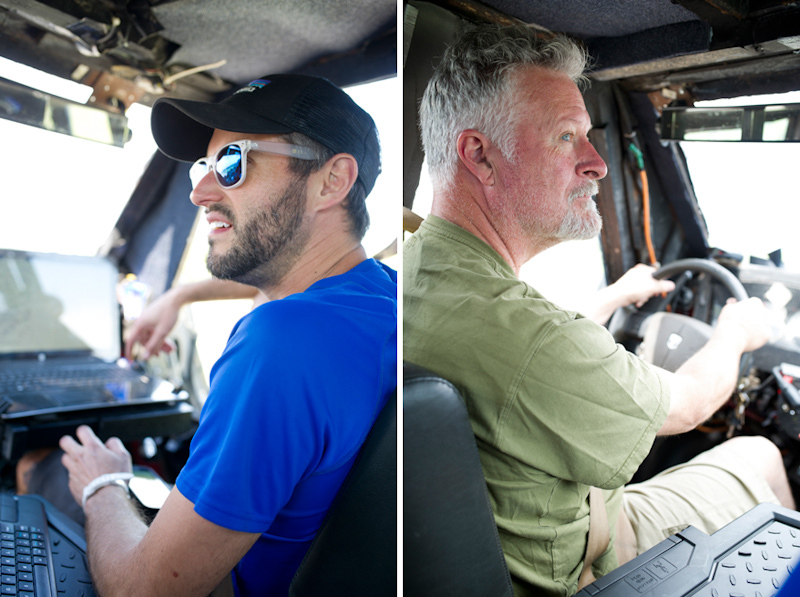 TIV takes the lead, Justin navigating, and Herb driving as we roll out from Weatherford making for the day's target of Abilene. 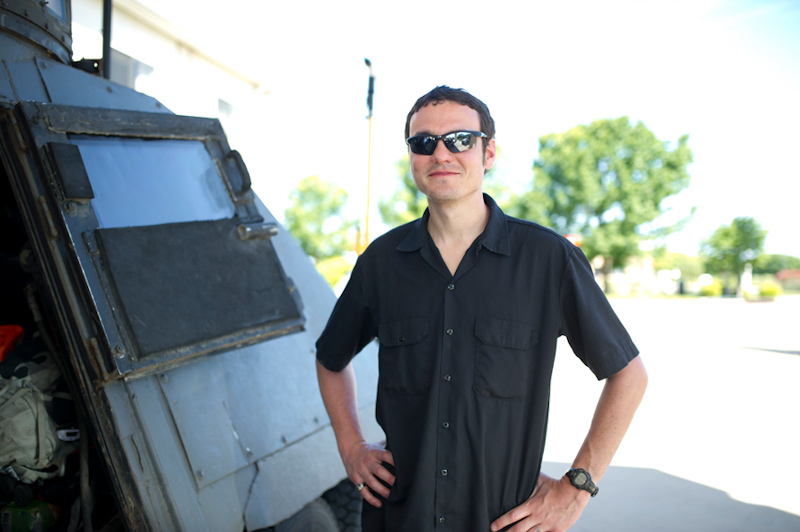 Brindley rides in the TIV on the way out to shoot the crew, while Payton and I follow in the van. 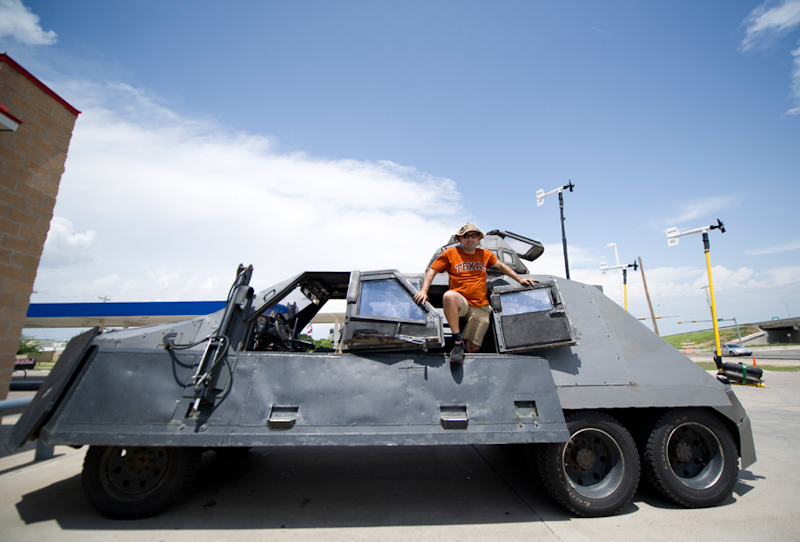 Sean preps the TIV for the chase while we're stopped at our target awaiting storm initiation. 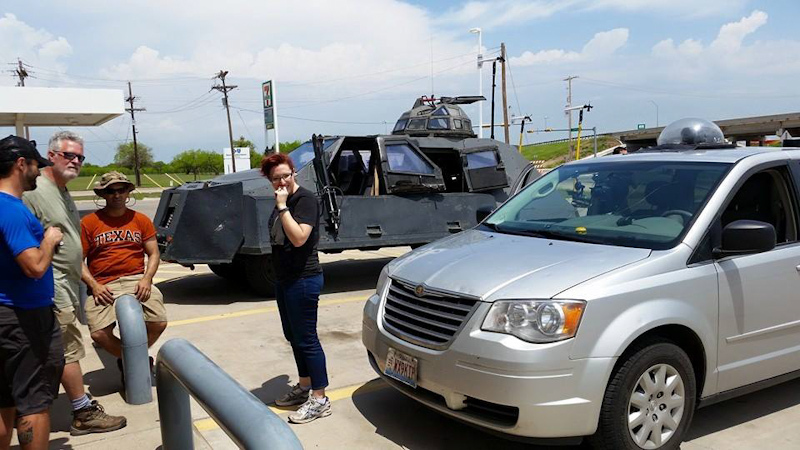 The fans are ever present every place the TIV stops. It is a moving attraction that you can't miss. 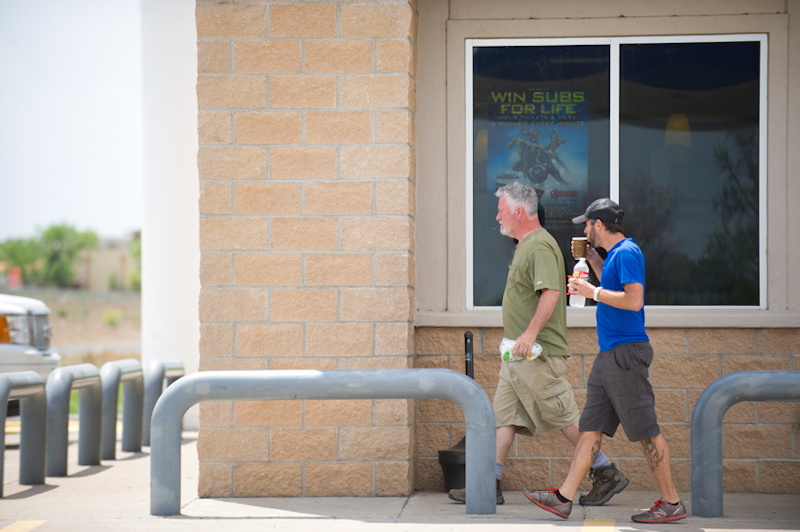 Justin and Herb walking out of Subway with some lunch. 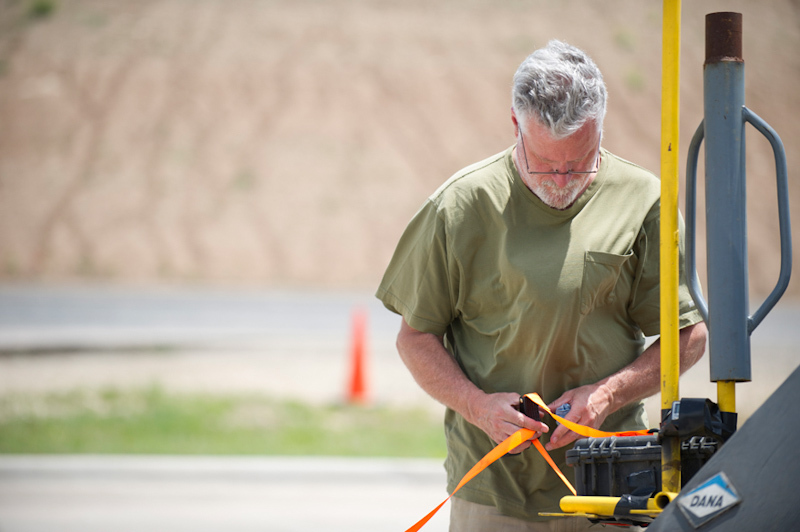 The fast food chain is practically our home while on the road, serving the majority of our on the run meals. Bubbles and TIV together again. Right on cue, a tornado watch goes up and we are sitting smack dab in the middle of it. The phones come out as tiny blips start to appear on the radar apps. This is a nail biting time for the forecasters. A clear, dark blue vault extends overhead, but storms are exploding 50 miles away to our north and south. Darkening the distant horizons and sending wisps of cirrus overhead from their anvils. 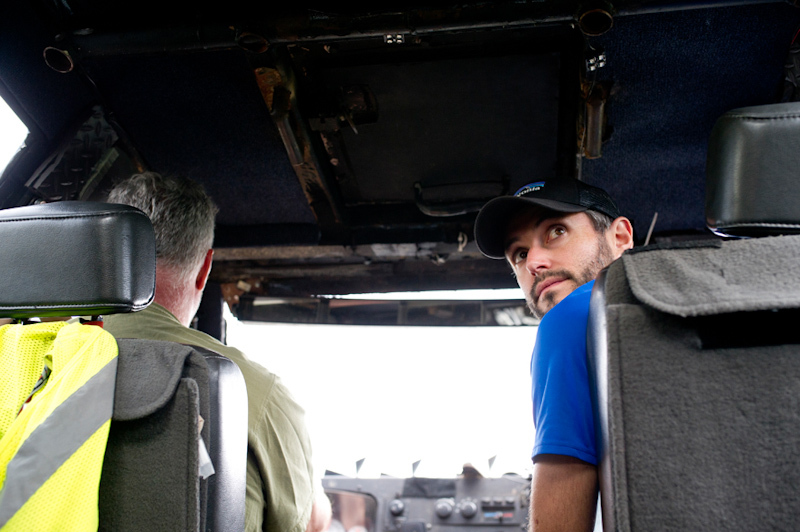 I monitor the radar from within the van, Sean, Justin, and Herb looking on. Chasing rarely offers an easy slam dunk intercept. 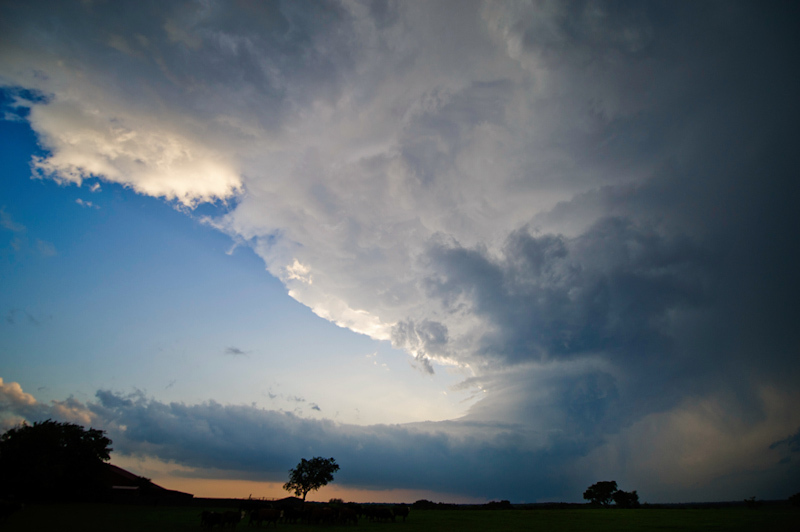 On this chase we found ourselves stuck between two enticing supercells. Which to go after? The north storm looked better defined. Tail End Charlie is often favored in the long run. North or South? Temp/dewpoint spreads are higher to the south and Tail End Charlie will be tougher to get in front of. Will the north storm maintain itself? South or North? The question will plague chasers forever. We hold our ground wait for a clear winner not wanting to jump the gun and pick the wrong storm. My anxiety builds, however, as we sit under blue skies while two monster supercells churn nearby. The north storm goes tornado warned, the hook becoming better defined and the velocities starting to pick up indicating low level rotation. Tail End Charlie sputters and struggles to organize. Our decision has been made. We're going north. 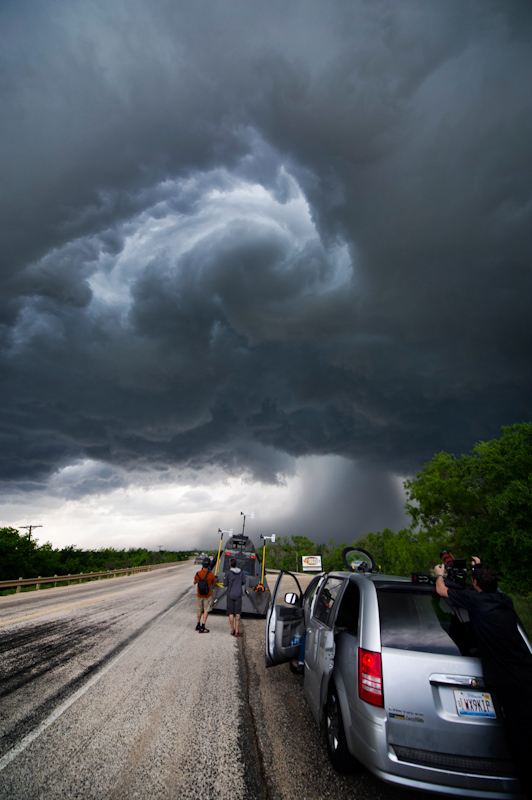 We approach the supercell's flanking line first with streaks of rain under a long narrow base. Turning north and east for the intercept, the hook end of the storm comes into view, shrouded by RFD precipitation. 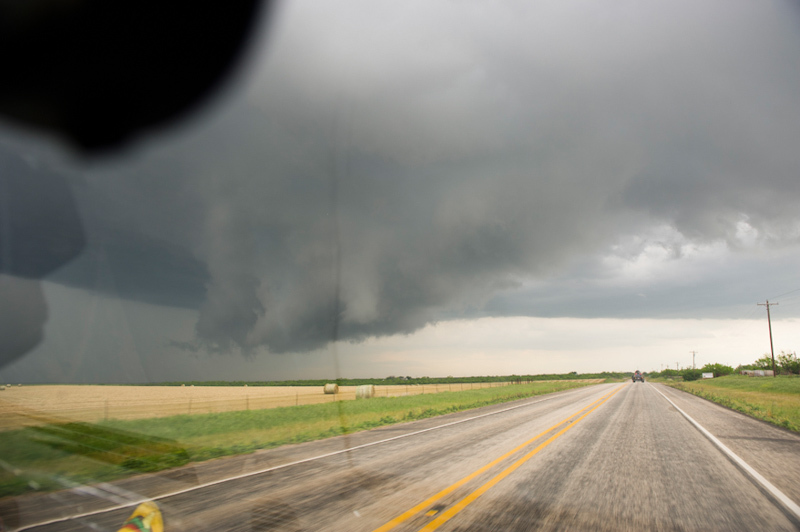 Near Anson, we pick up a northeast highway that parallels the storm and comes in behind a classic, block wall cloud. Our storm and approach is looking great. Our storm sputters a little, the hook becoming squirrely, and the wall cloud falling apart. 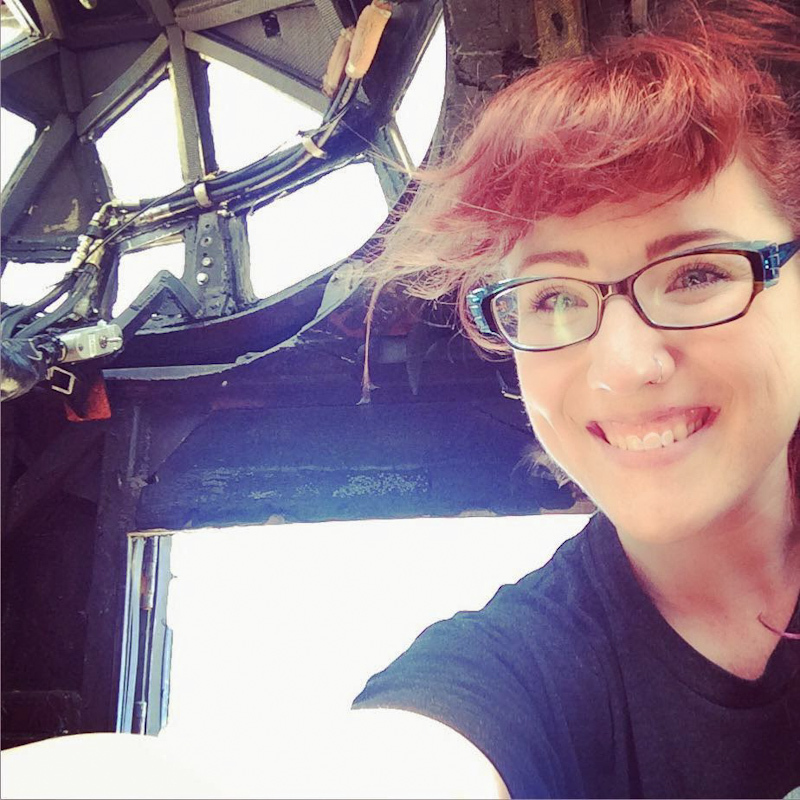 We hope for a cycle and reorganization. The storm cycles and a large bowl lowering starts to take shape. We turn north for the intercept. 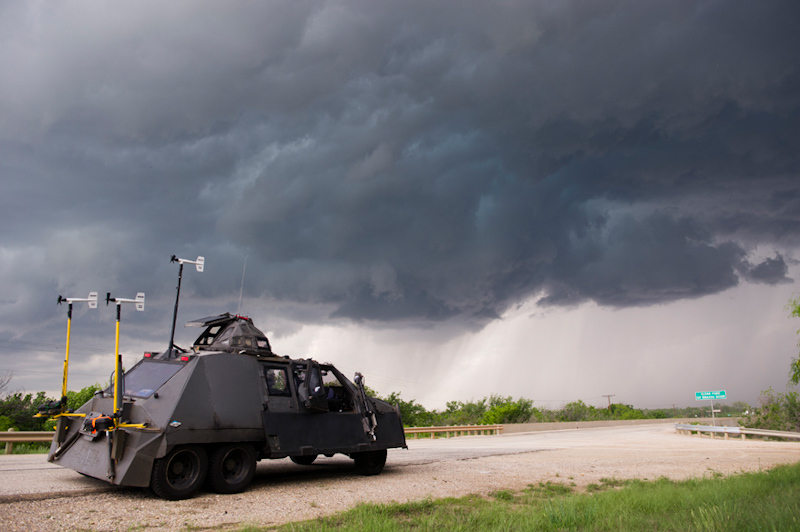 The massive cloud structure dwarfs the TIV from our perspective. Sean is ready for action, sporting his helmet and Red camera. The wall cloud is losing definition again though. The storm is not cooperating. However, as the area where the huge bowl mass had once been now moves overhead, the storm opens up and presents incredibly dramatic structure. 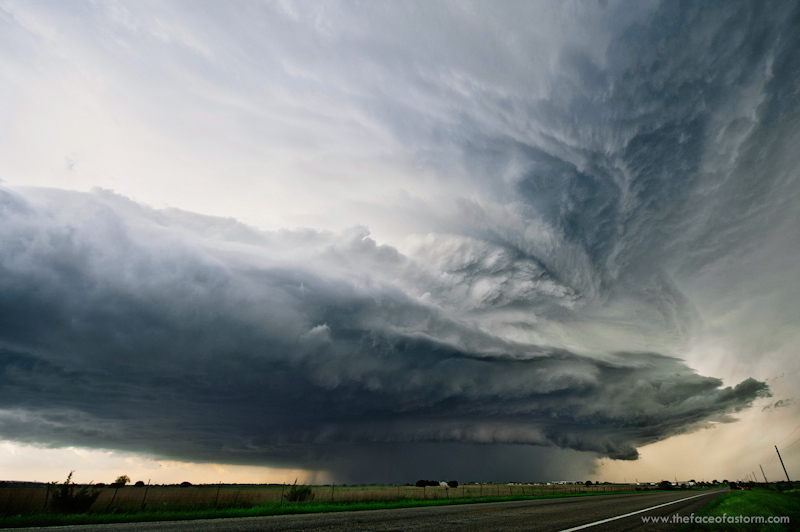 The clouds churn with a tight rotation as a vortex twists away in the base. The scene is surreal, mesmerizing, and nearly overhead. Brindley shoots an extreme wide angle capturing us and the vortex, the top of the image looking straight up. The feature spins at tornadic speeds. 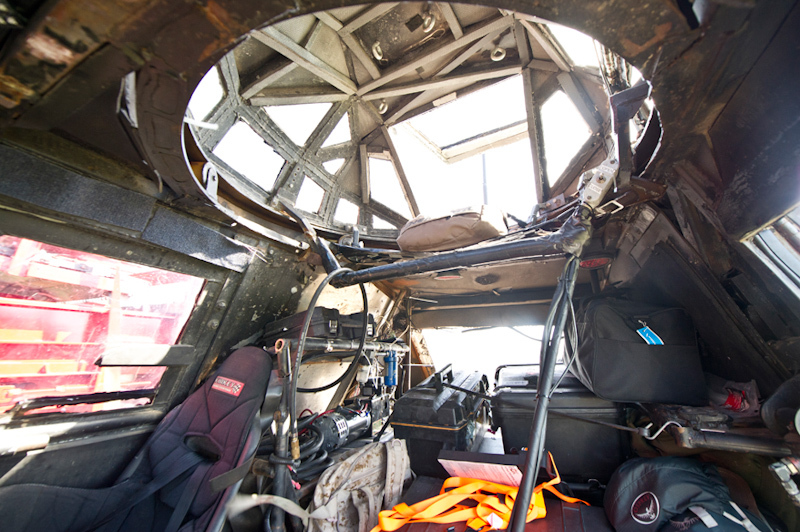 We anticipate the condensation funnel's descent and our intercept, but it doesn't happen. Within a couple minutes the whirlpool dissperses in the storm's base and the storm moves off to the east as it too began to dissipate. It was a great catch and would make for a dramatic shot in the film though. 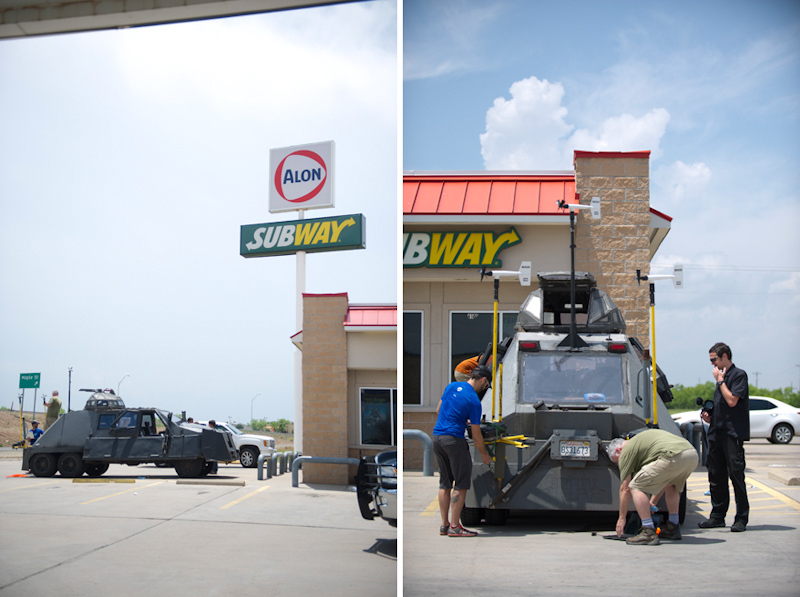 We stopped in Albany at a rustic gas station to regroup with a new plan of attack as our storm was falling apart, and tornado reports were streaming in on the Tail End Charlie storm. The new plan was to split up, divide and conquer, and send Bubbles south. 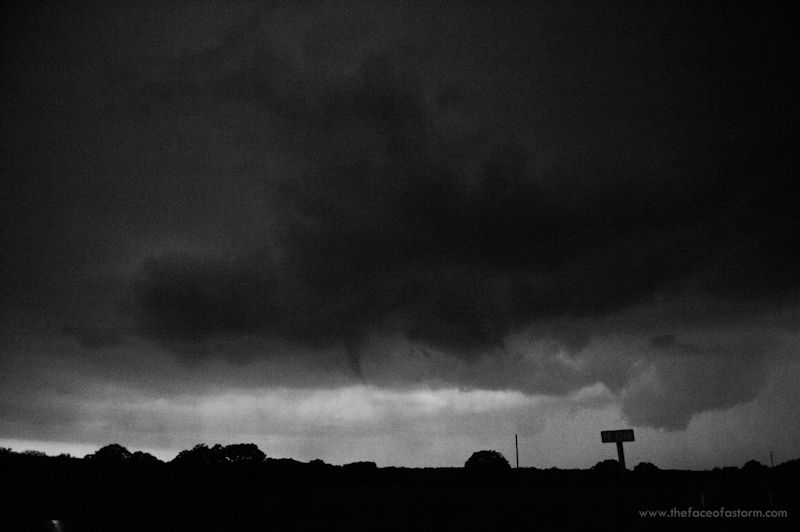 We'd be playing a huge game of catch up, but we wanted every chance to get our tornado shots. 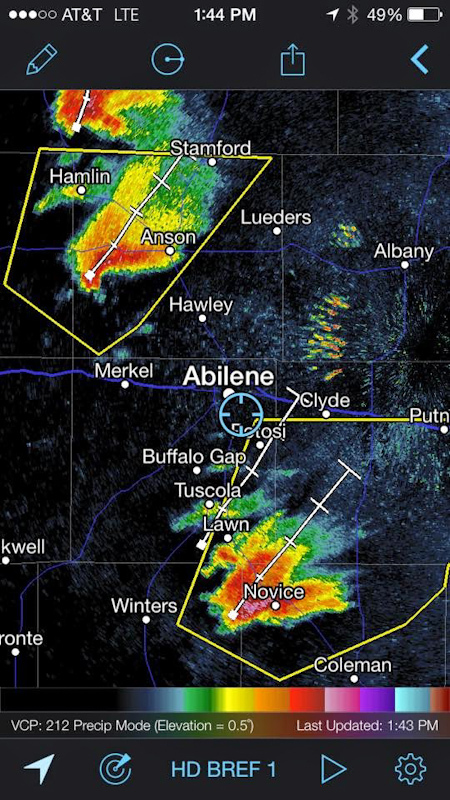 TIV would stay north on the closer supercells. Brindley, Payton, and I raced southeast to get on to Tail End Charlie. 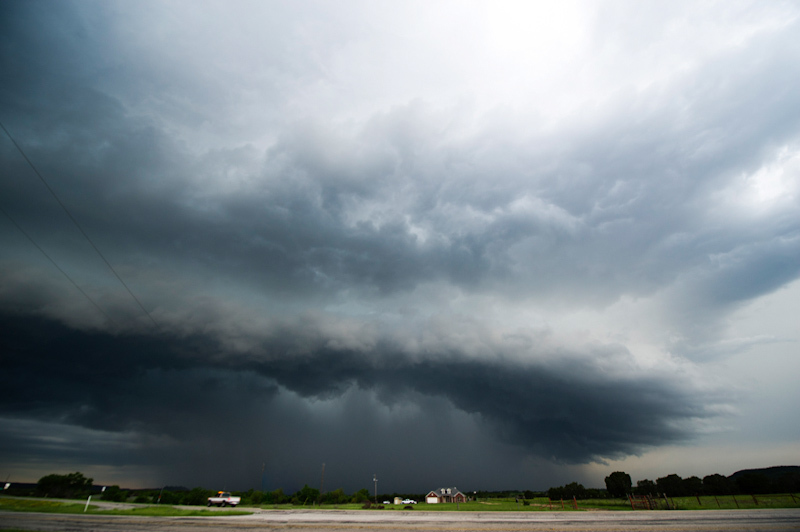 Coming into the town of Dublin, we found ourselves in the immediate wake of the supercell. Inches of hail had fallen and accumulated on the ground. The roads and landscape turned white like it was winter. Cars were losing traction and even sliding off the road in places. 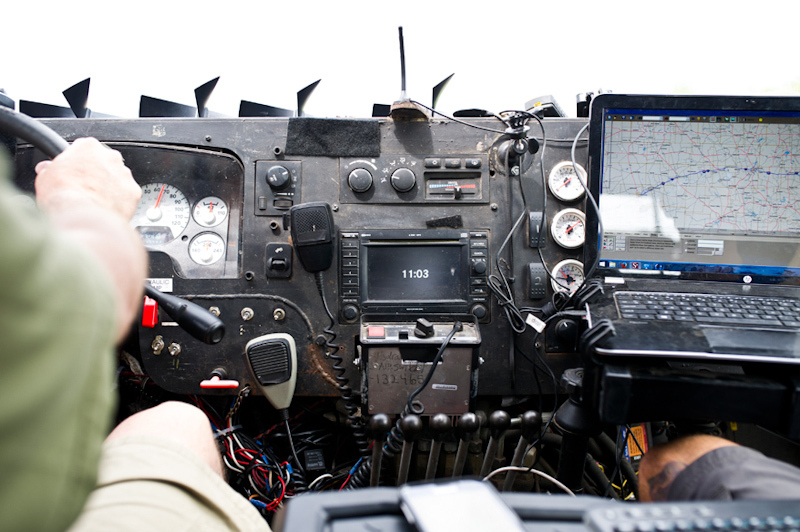 Our forward speed came to a crawl as we negotiated the hail and got stuck behind puttering local traffic. 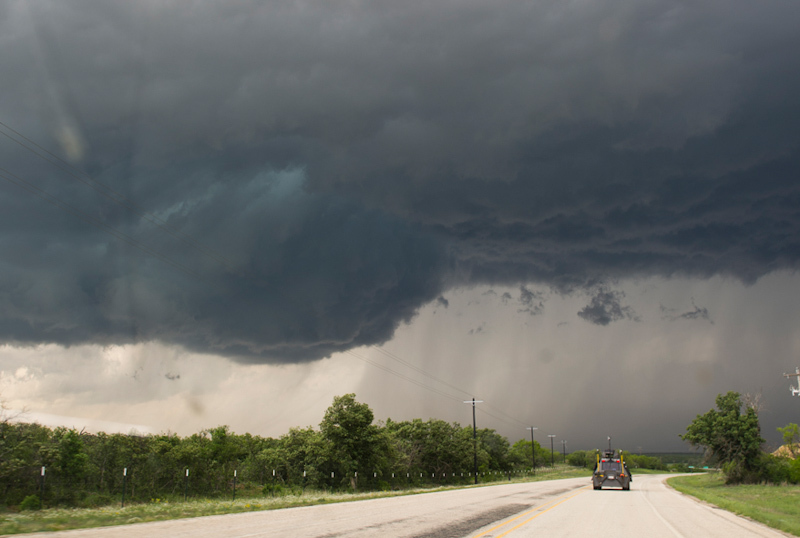 We manuevered south of the storm and were finally able to get in front of it using the criss crossing roads of the Texas grid. 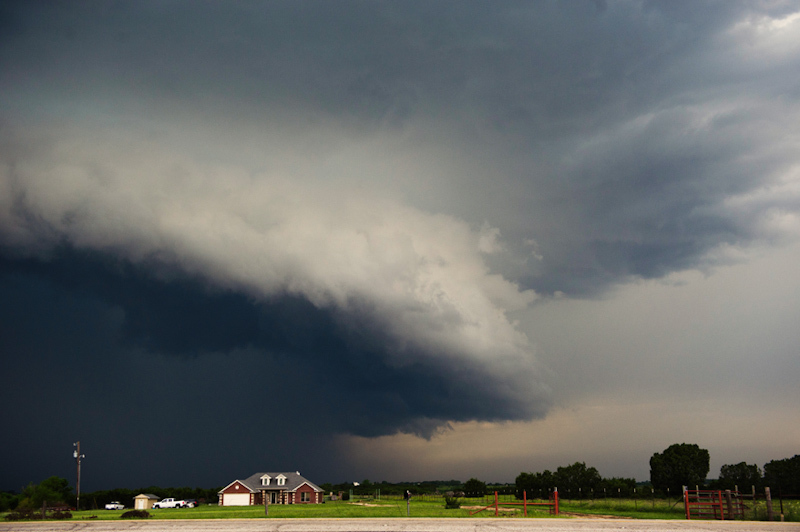 The storm had long since transitioned into a high-precipitation mode, but the structure was still other worldly. A gigantic updraft that looked like it had been carved from a solid mass of stone soared overhead and twisted with barber pole striations. The storm was still tornado warned, but any tornado would most likely be obscured from our view. 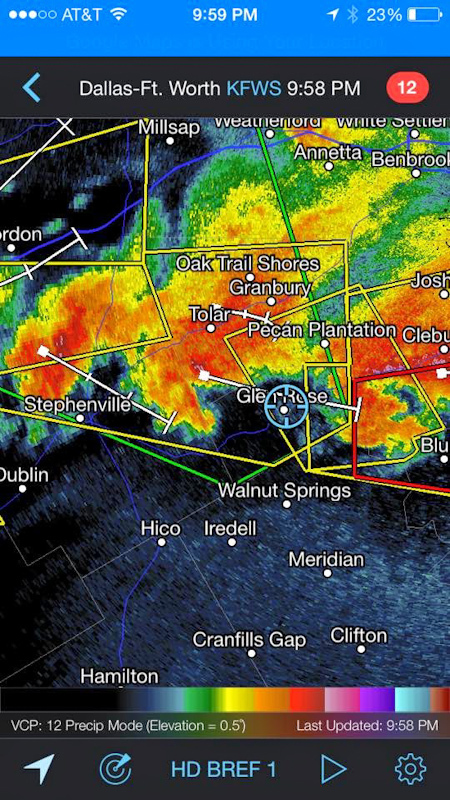 The core of the supercell was tracking right up our road, forcing us to drop out of the path to the south. 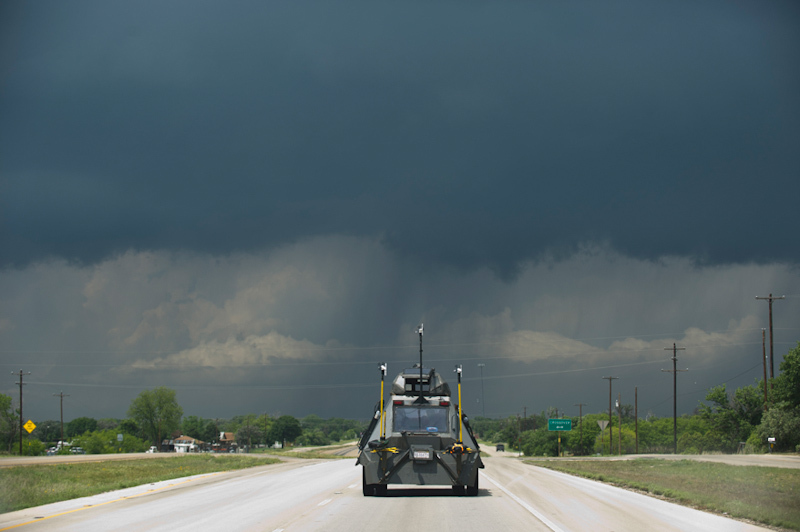 We stayed as long as safely possible, time lapsing the approach, while a long line of chasers came up the highway bailing east to also get out of the way. Looking northwest from our new position south of the hook. The storm moved on to our east, enveloping everything in its path with hail and wind. We'd have little chance of shooting a tornado while the RFD obscured the base. However, we had no other safe approach. 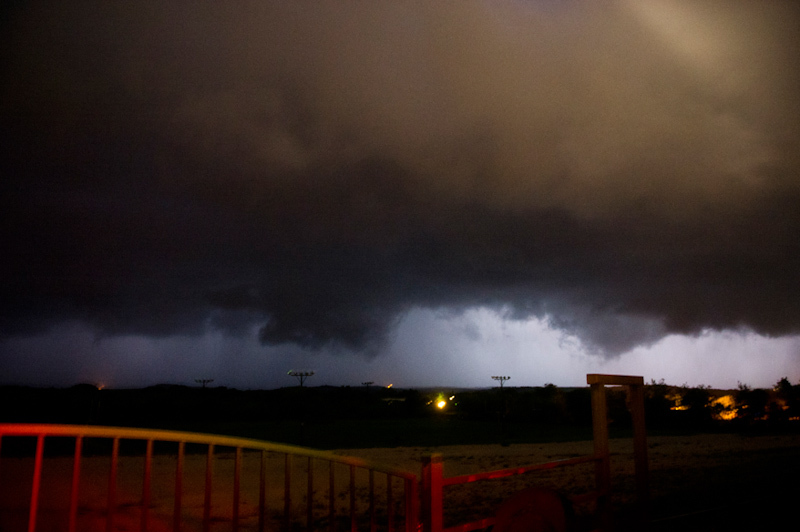 A cone tornado was reported shortly after this, partially visible from within the inflow notch to the north before it dissipated after a couple minutes. 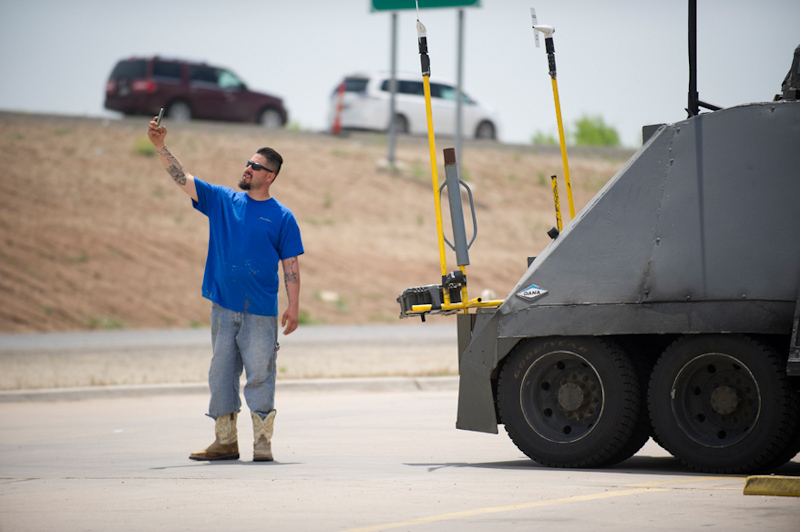 The storm had a long history of producing tornadoes, but apparently none of them were very photogenic. A dry surge under the base cleaned out some of the RFD and a rather classic looking wall cloud was visible to the north. 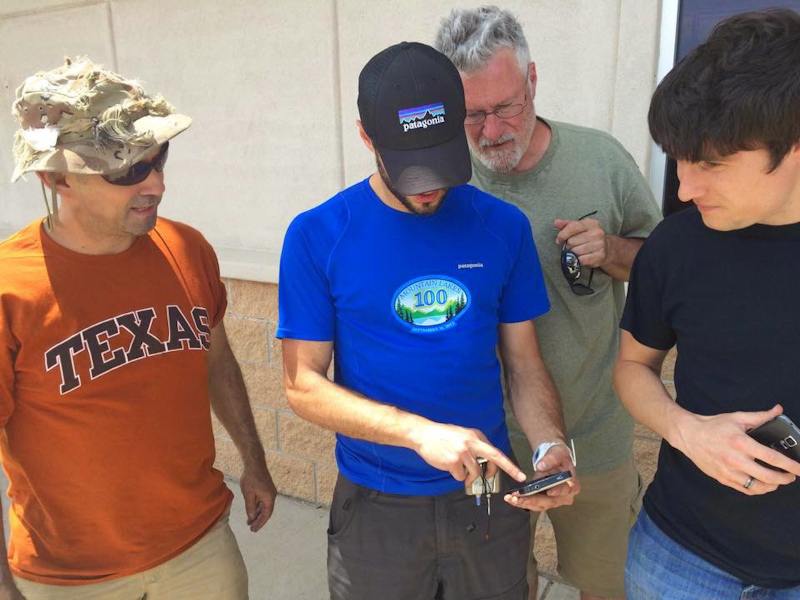 We watched it closely for tornadoes, but spotted none. Our tornado warned supercell appeared to be gusting out, so we decided to let it go. Another storm right on its heels was organizing rapidly, however. If it wasn't stuck behind the lead storm's gust front it would have a better shot at producing tornadoes. 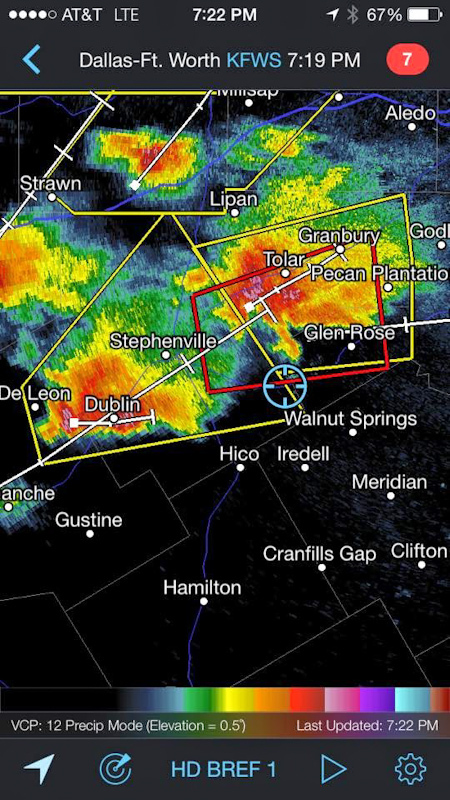 We decided to move in for the intercept north of Hico. A gorgeous LP to Classic type supercell appeared to in the west sky as we moved north of Hico, suspended in clear blue skies with a skinny barber pole updraft tower, mammatus studded anvil, and inflow bands feeding into the base. We stopped a few miles short of it to time lapse and let the storm organize as it came to us. 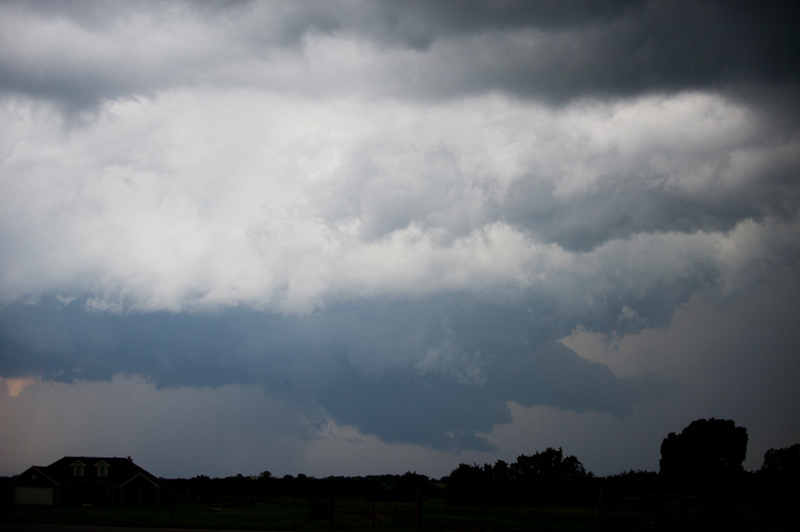 A wall cloud being molded by RFD started to appear under the base along with the characteristic horeshoe shape. The storm picked up a tornado warning. We moved north slightly to get directly down stream of the feature in anticipation of a close tornado shot. 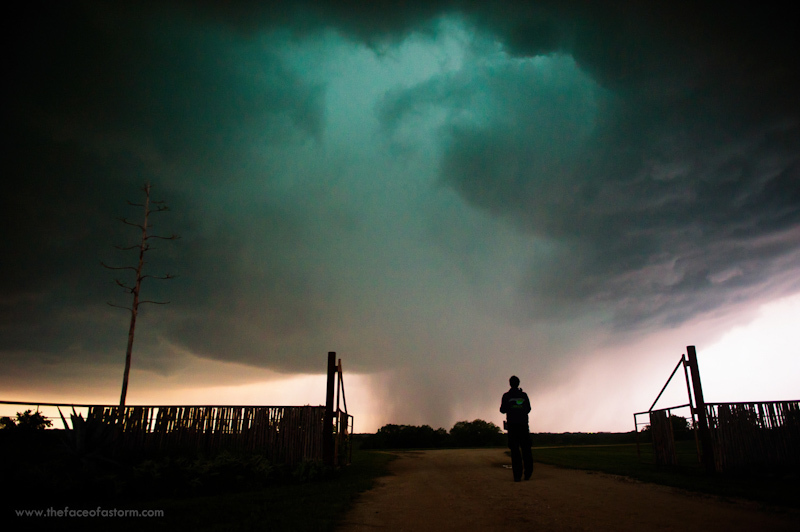 A mesmerizing blue green RFD core approached, rain bands spiralling around the feature. I had seen similar structure on a number of other storms that produced tornadoes within a couple minutes of exhibiting this structure. With the last of the sunset light, we hoped we were about to get our shot of the day. The blue green circulation moved overhead, passing just to our north. The center of rotation seemed to become less focused, the structure fading, and we began to lose hope. Then, in the last of the twilight, a rope funnel descended from the base. It was extremely difficult to shoot in the low light, but Brindley was able to snag a good still of it. We watched it snake along in the clouds for a couple minutes before it vanished. It would be the closest thing we'd see to a tornado all day. Down the road we could hear laughter and voices. It was too dark to see anybody, but the laughs were unmistakable. It was Adam Lucio and Ben Holcomb. We called back to them in the darkness, before moving up the around to keep up with the storm. The clouds broke overhead momentarily revealing the moon and moonlit anvil. It was a moment of wonder that you just couldn't properly catch with the camera. Such moments seem to make the chase so much more magical. 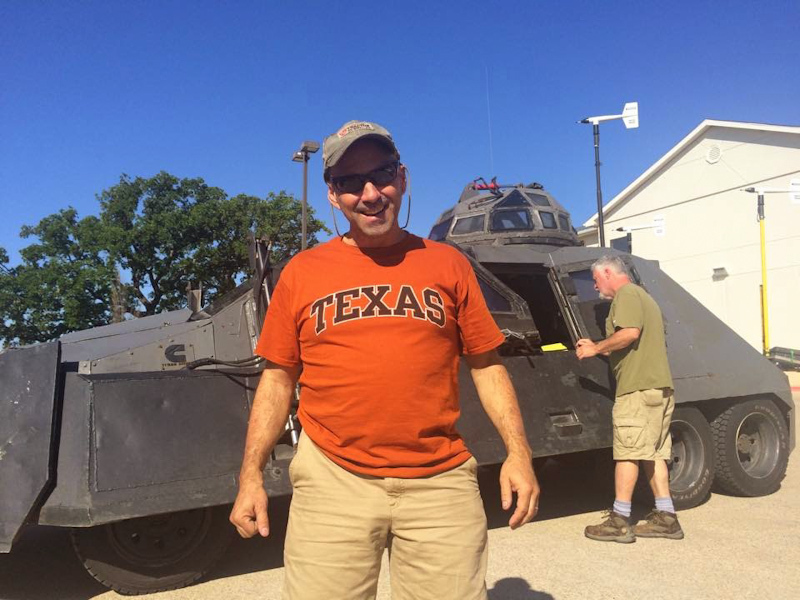 Darkness fell and the TIV crew headed to Glen Rose to get a room for the night. There were still tornado warned supercells near us though, so Brindley, Payton, and I decided to stay out hoping to catch a nocturnal tube. We watched scuddy gust fronts from afar, the lightning momentarily illuminating a variety of shapes but no tornadoes that we could see. It was getting late and folks were getting tired and hungry after a long day so we decided to call it and head into Glen Rose to meet up with the TIV crew. 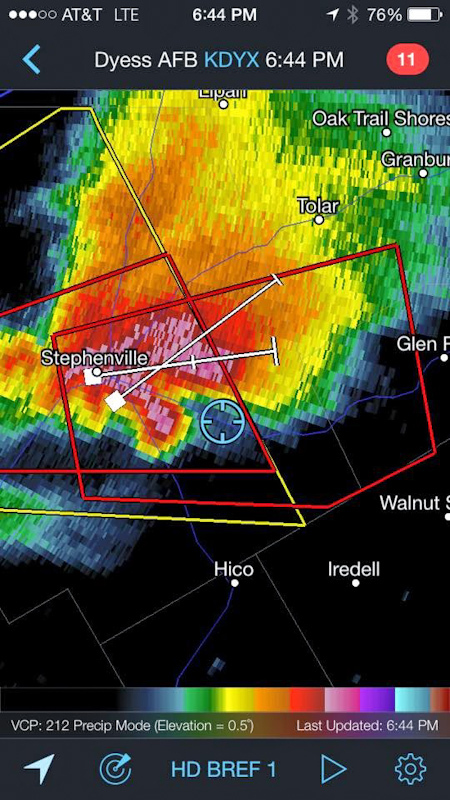 We headed east, threading our way between ongoing supercells and on the heels of one that was still producing tornado reports and threatening Glen Rose. We made it to town to find the hotel intact and with power. We got the van unloaded just in time too. 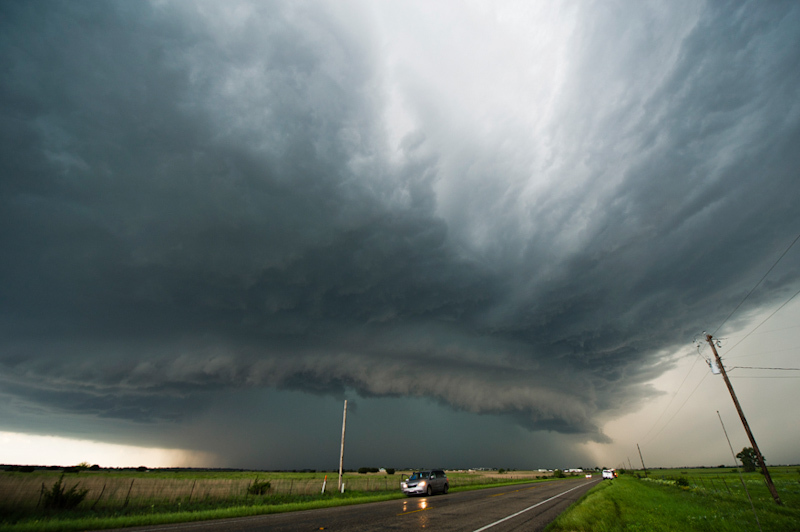 The core fo a supercell hit minutes later bringing powerful winds, lightning, sheets of rain, and a blast of hail. We all gathered by the lobby front doors to watch the storm and drink a few beers. Marbles of hail were being blown in through the automatic doors and rolling into the lobby. The night ended with us discovering that water was streaming in through our room's window frame and pooling in huge lumps above the ceiling paint. 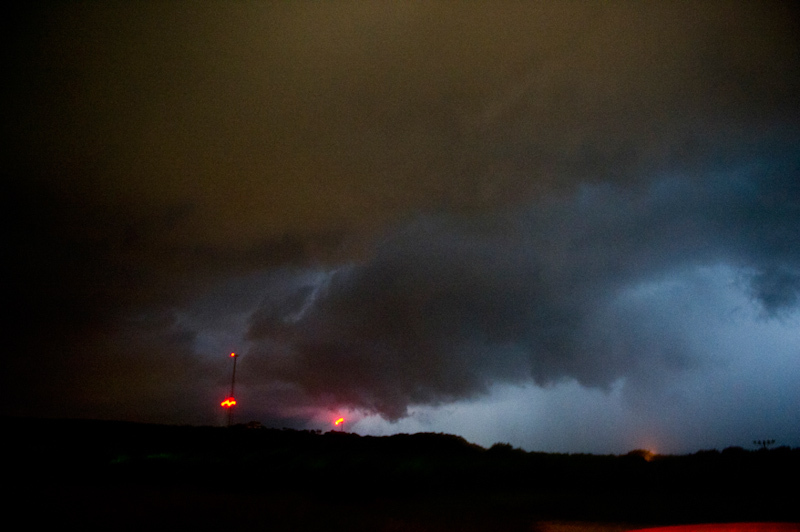 We didn't get our tornado shot, but what a well rounded chase with a taste of almost every facet of severe weather. 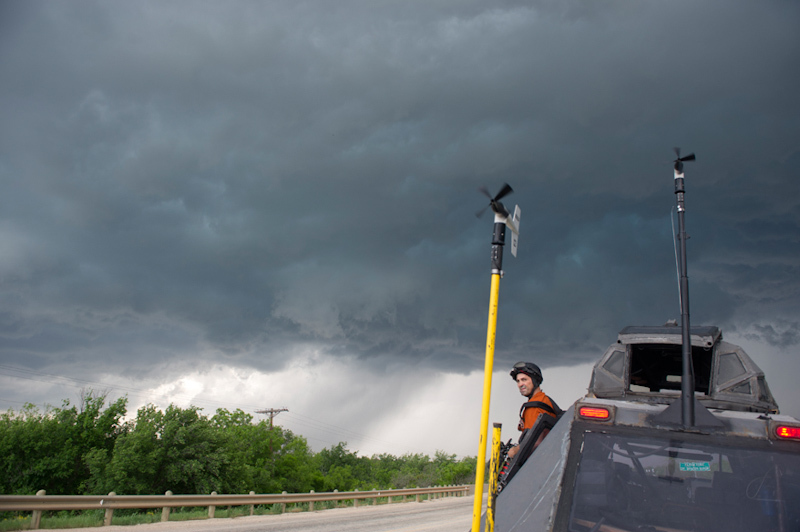 With dramatic structure, hail drifts, amazing whirlpool circulations and a funnel, providing for some usable IMAX footage, we counted this chase as a success. 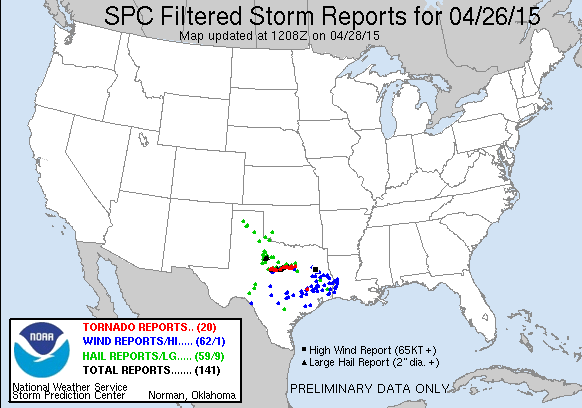 The tornadoes that we did miss turned out to be rather lackluster, mostly rain wrapped or brief, small spinups. Maybe default to the Tail End Charlie storm unless there are a lot of good reasons for picking one further north up the line. 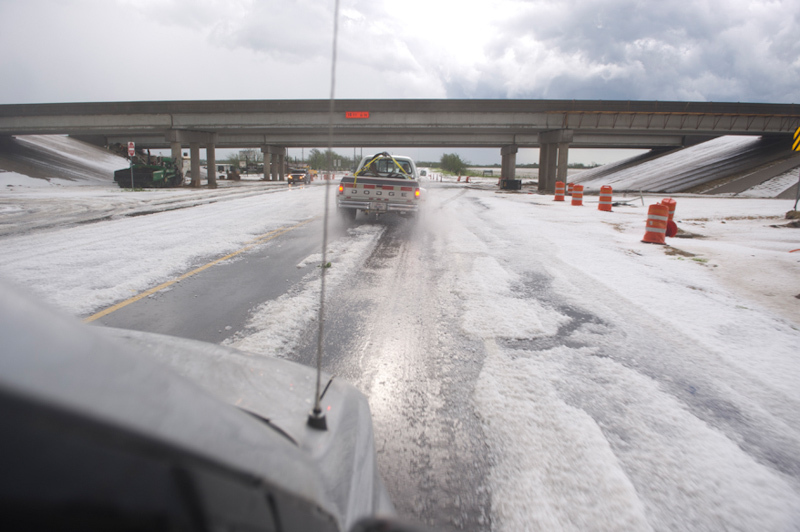 Try to avoid hail drifts when coming in behind your target storm.